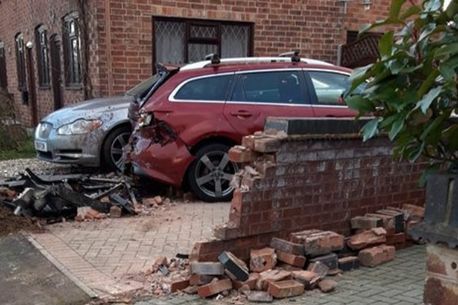 A knife gang attacked a man in a Bulkington street following a chase which led to his car careering into the front wall of a home. The victim, who is aged in his 30s, was attacked by a trio of men armed with what police have described as ‘blades’ on Wolvey Road. They set upon him following a car chase which saw the silver VW Golf he was in colliding with a wall and stationary vehicles. Detective Inspector Lisa Sears of Warwickshire Police said: “At this time we believe the victim’s car was pursued from Coventry by a white Audi containing the offenders. One of the lines of enquiry we are following at the moment is that the victim knew the offenders. West Midlands Ambulance Service sent an ambulance to the scene after being called by the police at just before 9pm last night (Sunday, January 13). "We treated a man for multiple injuries and he was taken to hospital for further assessment," a WMAS spokesperson said. Anyone with any information or witnesses should call Warwickshire Police on 101 for the independent charity Crimestoppers, which is free to call from a landline and confidential, on 0800 555 111.